Compare Tables for Excel provides a fast way to find duplicates and unique values in any two data sets: tables, columns, or lists. The tool can search for matches and differences by one or several key columns. Once the duplicates are found, you can select or highlight them, copy or move to another location, or delete all dupes at once. Search for duplicate or unique values Compare two columns, lists, or tables in Excel for matches and differences. Select one or more columns for comparison Check two lists for duplicate rows by comparing values in one or several key columns. 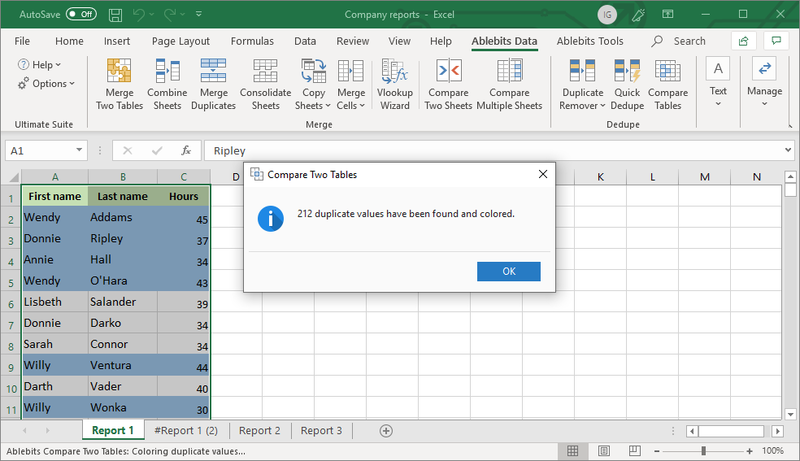 Remove duplicates in Excel sheets Deduplicate your worksheet by removing all repeated values or duplicate rows at a time. Highlight matches and differences Highlight duplicates and unique values with any color of your choosing. Copy or move duplicate records Move duplicate entries or copy unique values to a new worksheet or workbook. Identify matches and differences Insert a status column that marks each row as "Duplicate" or "Unique". Select unique or duplicate cells To find out how many duplicates are in your table, just get them selected. 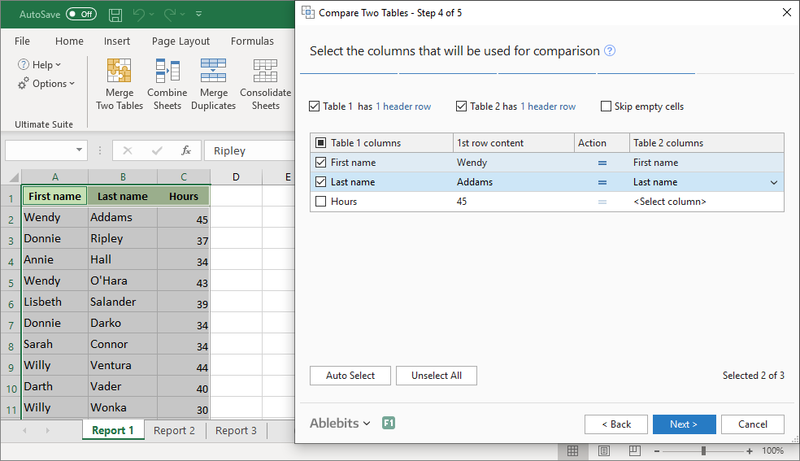 Compare two tables no matter their size Compare two tables with a different number of columns and up to one million rows. What is Compare Tables for Excel? Can't I compare lists for differences without any add-ins? 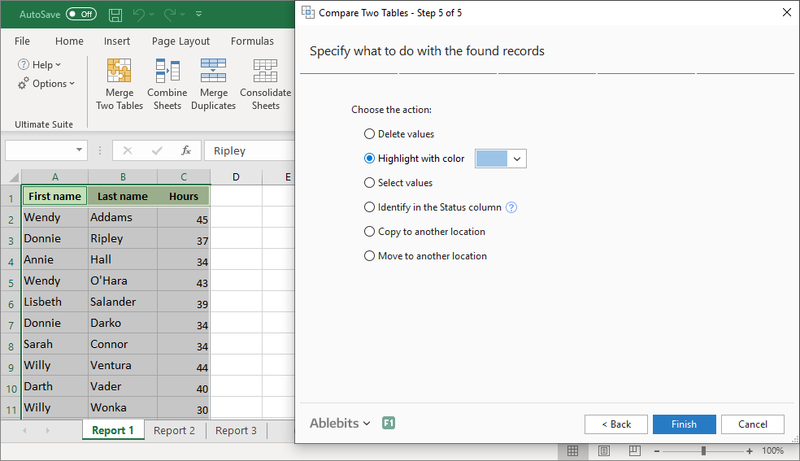 You can try to identify matches and differences between two lists with a formula, or you can use Excel conditional formatting to highlight duplicates. The problem is that a universal formula to compare data in Excel does not exist. Every time you will have to build a new formula depending on whether you want to check for duplicates or unique values, with or without first occurrences, etc. 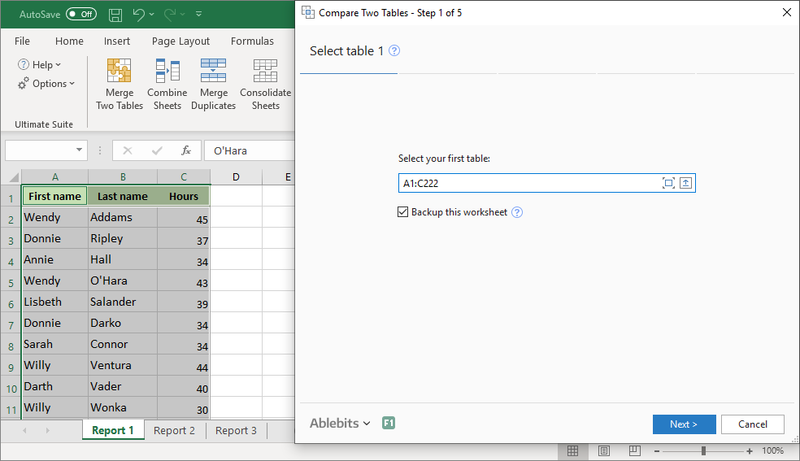 Compare Tables for Excel can handle all these scenarios and makes the process of looking for duplicates and unique values fast and easy. Why not deduplicate in Excel using the built-in Remove Duplicates tool? The Remove Duplicates feature available in Excel 2007, Excel 2010, Excel 2013 and Excel 2016 can only search for duplicates in one table. It cannot compare two columns for differences and matches. Nor can it highlight, select, or copy dupes, only remove them. How to find duplicates in Excel with this tool? For starters, please make sure both tables you want to check for duplicates are open in Excel, they can be in the same or different worksheets or workbooks. Select your main table. Since Excel won't let you undo changes, it makes sense to select the Create a backup copy of the worksheet checkbox. Choose what you want to find: duplicates (matches) or unique values (differences). Select the key columns for comparison. Choose the desired action for found data: select or highlight cells, remove duplicates, identify in a status column, copy or move the results to another location. Finally, click the Finish button and have your comparison done. For a more detailed instruction click here. I need to check for duplicates in two columns, will the tool help me? Yes. The add-in can compare two columns in Excel for matches. You just select the first column as your main table and the second column as the table for comparison. Can I find duplicate rows in two tables? Sure. 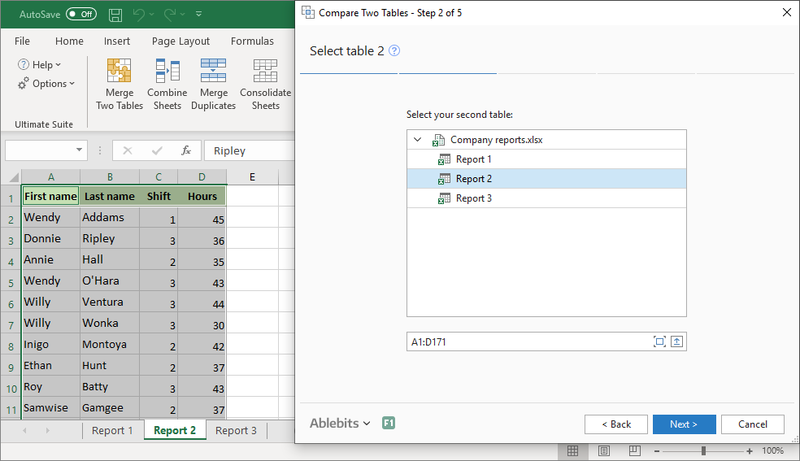 To find duplicate lines in two tables, select several key columns on step 4. In this case, the add-in will show you duplicate rows. Once the rows are found, you can remove duplicate lines in one click. How to remove duplicates with the Compare Tables tool? To remove duplicate records, on step 3 select to search for duplicates. On step 5, choose the Delete values option. As the result, all duplicates will be removed from the main table. Can I find dupes in two Excel tables without removing them? Of course, you can. The add-in offers plenty of options to deal with dupes apart from removing them. You can get them all selected or highlighted with color, copied or moved to another worksheet or Excel file. Also, you can add a column to your main table to identify duplicate and unique rows. How to compare two lists in Excel and find unique values? To find the differences between two tables, on step 3 select to check for unique values. On step 5, decide whether to select or highlight the unique values, or mark with a status column. I need to find unique values and copy them to another sheet, is it possible? Can Compare Tables highlight duplicates in two Excel tables of different size? Sure. The tool can find and highlight differences and matches in two tables of any size, no matter how many columns or rows each of them contains.